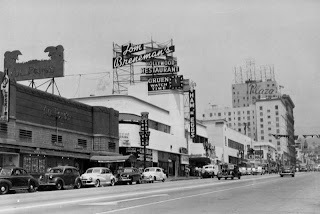 Dear Old Hollywood: Tom Breneman's "Breakfast in Hollywood"
Tom Breneman's "Breakfast in Hollywood"
Radio entertainment was never more popular than it was in the 1940s. During this time radio stations were popping up all over Hollywood. Vine Street was a particular hub for radio. Bob Hope, Jack Benny, Edgar Bergen, and Milton Berle were some the names that ruled the air waves and their fans flocked to Hollywood, or "Radio City" as it was sometimes called, to be members of the studio audience - much the same way audiences sit in on some television shows. 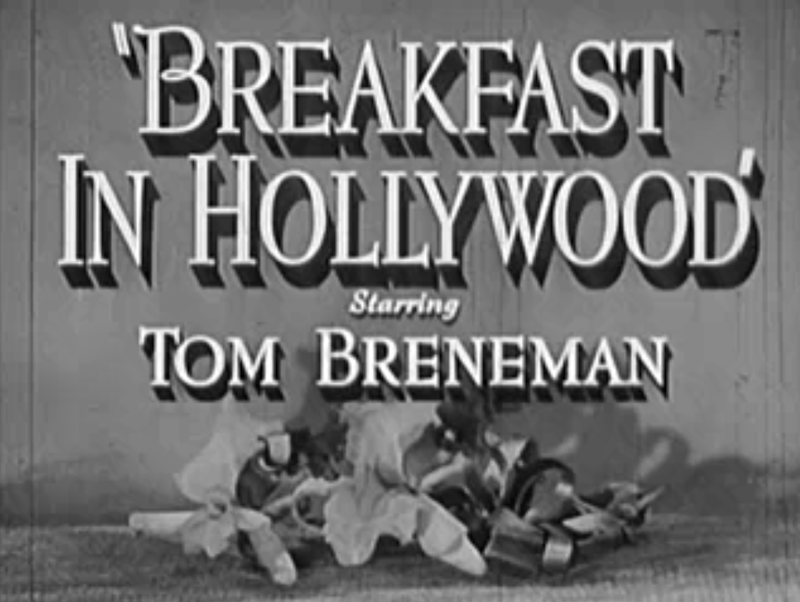 One of the popular radio programs that broadcasted from Vine Street in Hollywood was Tom Breneman's "Breakfast in Hollywood." This morning show was an unscripted program with much audience participation and fans lined up outside the studio as early as 5am to take part. 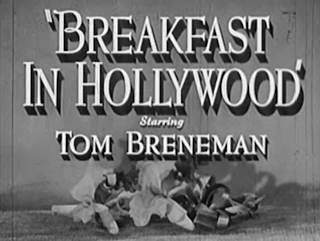 In 1946 Breneman and United Artists released a film called Breakfast in Hollywood as a way to promote the radio program. The film is not very good but worth watching to get an idea of how the radio program went and for some interesting cameos by Hedda Hopper and the Nat King Cole trio. Breneman originally hosted Breakfast in Hollywood from the former Tropics nightclub on Vine but later bought the Hollywood Recreation Center next door, converting the bowling alley into a restaurant and radio studio. Most of Tom Breneman's Hollywood Restaurant is torn down, however, the facade still remains. If you look at the two photos below you can see how the streamlined facade has been incorporated into what is now a condominium and retail space. 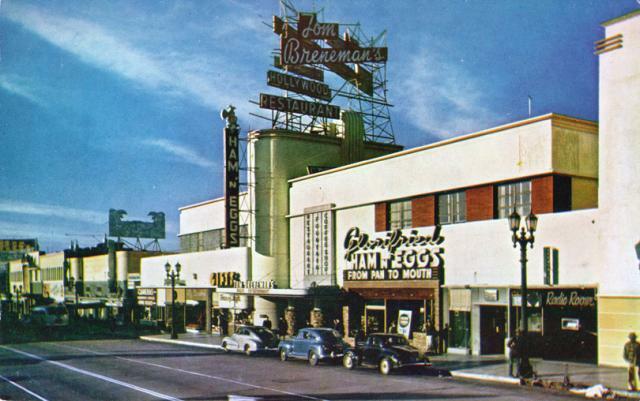 On April 28, 1948, just before the broadcast of Breakfast in Hollywood was to begin Breneman had a heart attack and died. Garry Moore took over hosting duties but the show quickly failed without Breneman. After the radio program ended Sammy Davis Jr. and investors purchased the building. The next tenant would be ABC which used the space for ABC Radio Center. Eddie Cantor and Frank Sinatra both became disc jockey's at ABC and Louella Parsons did an interview show with celebrities at the Vine Street location. Amazing, as always, historical coverage. Yes the movie is a clunker, but an important record nonetheless. I never knew that Sammy Davis was a part owner at one point. The Country Girl starring Grace Kelly, William Holden and Bing Crosby. A treat for all film lovers around the NYC area! On Thursday, August 12, grab your family and friends to the Elevator Acre for a free outside screening of the 1954 Oscar award winning film, The Country Girl. Adapted from the Clifford Odets play and starring Grace Kelly, William Holden and Bing Crosby in his greatest performance, the classic drama tells the story of an alcoholic has-been Broadway actor struggling with the one last chance he's been given to resurrect his career. So lets meet up! bring a blanket, invite your family and friends for a classic movie night! Great Blog, Robby. I have spent the better part of Monday morning reading page after page of this great collection of history, and quite enjoyed myself. Thank you for the time and effort you put in here. 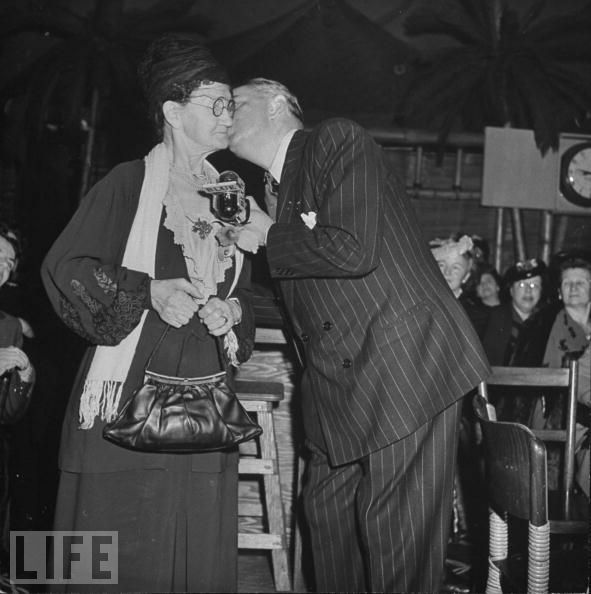 This is the only post that mentions legendary Hedda Hopper. I have just read some interesting bio on her and she refers to her Beverly Hills home as "the house that fear built." Do you have any pictures or history about her home? Keep up the fine work and all the best to you. Hi, much delighted to come across this wonderful blog.I'm a Swedish writer/hollywood history buff who lives two min away from the legendary spot! Love it! I love listening to the Breakfast In Hollywood broadcasts and have every available show. Easy to understand its possibility. Tom was such an endearing fellow. The film is very enjoyable too. After listening the radio shows and being familiar with the show's format, and hearing all the jokey references to the film in its buildup and aftermath, it makes it a far more enjoyable movie than it would be to someone who never heard the show.